Modelling scenario-based cumulative effects of emissions from proposed industrial development in Northwest BC for a government regulator. The BC Ministry of Environment commissioned two scenario-based cumulative effects studies of air emissions from existing and proposed industrial development to inform facility-specific decisions and regional air quality management. 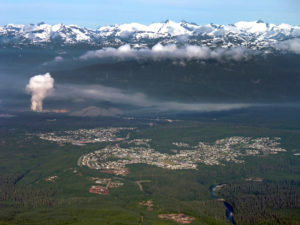 The Kitimat and Prince Rupert airshed studies modelled a range of future emission scenarios and provided the government regulator with science-based information to support the permitting of industrial development while avoiding unacceptable impacts on human health and the environment. The town of Kitimat straddling the Kitimat River, just upstream of the Kitimat LNG facility. In 2013, a sparsely populated and relatively undeveloped area of Northwest British Columbia was slated for rapid industrial growth which raised questions about how this would change regional air quality over the next decade. 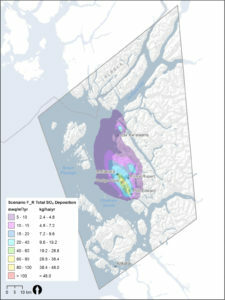 Numerous liquefied natural gas (LNG) export facilities were proposed for the coastal areas of Kitimat, and Prince Rupert, in addition to already existing sources of industrial emissions. 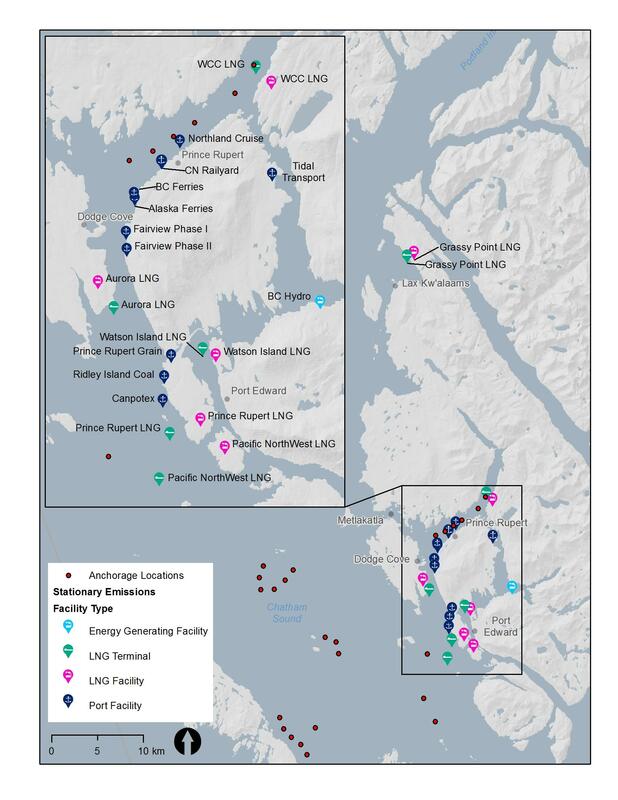 A map of the region around Kitimat and Prince Rupert, showing numerous LNG facilities and the ports and anchorages affiliated with LNG transport. The uncertainty focused on the potential effects of emissions of sulphur dioxide (SO2), nitrogen dioxide (NO2) and fine particulates (PM2.5) on human health and the environment. The government wanted to understand and compare potential risks under different scenarios representing a range of emission sources and emissions treatments, and have science-based information to inform decisions about future industrial development and avoid unacceptable impacts on human health and the environment. 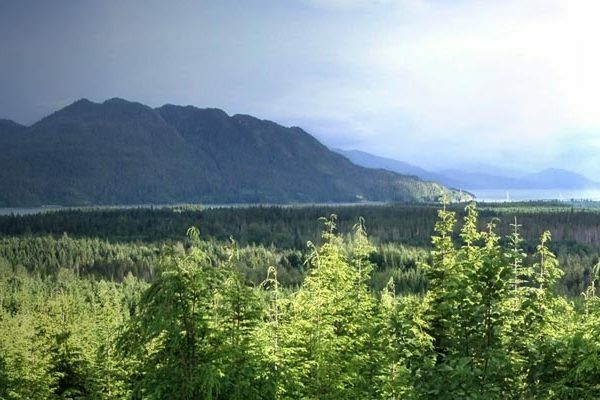 The BC Ministry of Environment (MOE) contracted us to conduct a rapid scoping-level assessment of the potential combined effects of SO2, NO2 and PM2.5 emissions on human health, vegetation, terrestrial ecosystems and aquatic ecosystems in the Kitimat and Prince Rupert airsheds. For a relatively small company, we have a wide breadth of knowledge and experience, as well as a collection of expert associates and collaborators. For these studies we built a multidisciplinary team that included Trinity Consultants, Risk Sciences International, Dr. John Laurence and Trent University, all qualified professionals with expertise in the fields of air dispersion and deposition modelling, human health risk assessment, terrestrial plant pathology, and acidification and eutrophication of terrestrial and aquatic ecosystems. An example of a predicted Sulphur deposition map under just one of many future modelled air dispersion scenarios carried out for the airshed study. Given the numerous industrial facilities proposed in the Kitimat and Prince Rupert airsheds, there were many possible combinations of emission sources and emission treatments that could be modeled. We narrowed the selection down to eight future scenarios for the Kitimat Airshed study and seven for the Prince Rupert Airshed study. These represented a range of emission source and treatment combinations, bookended by the highest and lowest emission scenarios. The study approach had many dimensions. Our team used the CALPUFF model used to predict future atmospheric dispersion SO2, NO2 and PM2.5 emissions, and future deposition of sulphur and nitrogen in the region, for each scenario. We compared predicted atmospheric concentrations of these pollutants to evidence-based thresholds in the literature to assess potential impacts on human health and terrestrial vegetation. We used a suite of models to assess the potential for future predicted deposition to exceed critical loads of sulphur and nitrogen in soils and water, to assess potential impacts on terrestrial and aquatic ecosystems. The results had to be clearly understood by decision-makers and the public. The challenge was to find a method that would be applicable for all of the different receptors and assessment methods used in these studies. We created colour-coded risk categories that were used to convey the results for all four receptors. While the meaning of these categories for the environmental receptors was different than for the health receptors given the nature of the respective analyses, these colour categories provided a simple and effective way of communicating the relative results for all receptors across all of the scenarios. The end result of the two scenario-based cumulative effects studies was a screening level assessment of the range of risks associated with emissions of SO2, NO2 and PM2.5 from proposed industrial development in Northwest BC. 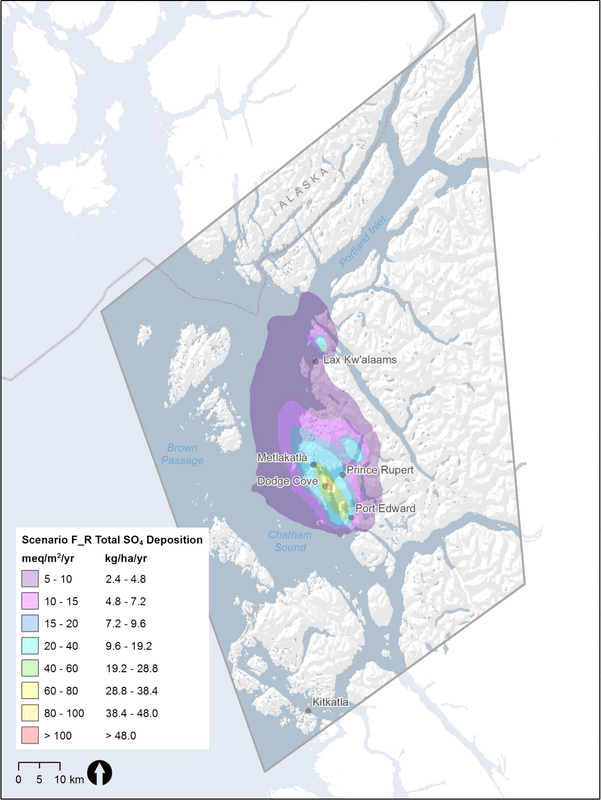 Our analyses gave the BC Ministry of Environment objective, robust science-based information to support the management of emissions in the Kitimat and Prince Rupert airsheds. Journal paper in Atmospheric Environment: Williston, P., Aherne, J., Watmough, S., Marmorek, D., Hall, A., de la Cueva Bueno, P., Murray, C., Henolson, A., & Laurence, J. A. (2016). Critical levels and loads and the regulation of industrial emissions in northwest British Columbia, Canada. Atmospheric Environment, 146, 311-323. Download Document.